There's lots of action at this family-friendly Maui resort. 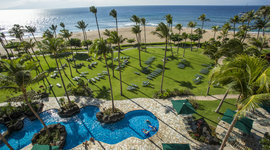 Grownups can enjoy a mai tai by the huge 3.5-acre swimming pool, a workout in the fitness center, golfing nearby, on-site tennis, or relaxing with a well-deserved spa treatment. For the kids there's a fun keiki club with lots of activities, as well as waterslides and a pirate ship pool. You're just steps away from the world-famous Kaanapali Beach. After a long day of fun, there's nothing like relaxing in your spacious one- or two-bedroom condo residence. Most condos include a full-kitchen and washer/dryer, perfect for longer stays. You also have access to three delicious restaurants which are located in the family-friendly resort. 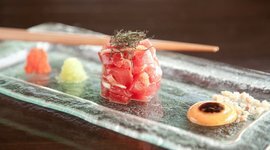 Perched on cliffs above the Pacific, this elegant open-air restaurant serves top grade sushi rolls and sashimi. 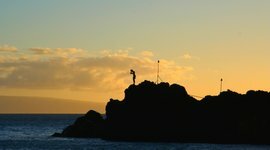 Every night from Black Rock Beach, you can watch a torch lighting ceremony that ends with a 30-foot plunge into the ocean. 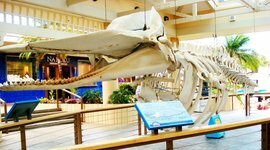 On Ka'anapali Beach, this open air shopping pavilion is filled with restaurants, shops, and a whale museum. 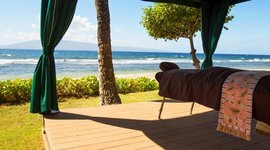 Lie-down in a shaded beach cabana, and let the masseur to the rest. Then hop in the steam room to finish off. 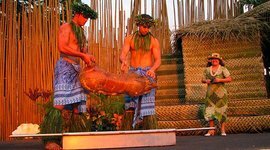 One of Maui's most affordable Luau's, you get one free ticket for kids 6-11, and all kids under 5 get in free. If you're staying on West Maui, this is a great restaurant to grab snacks before venturing out to Hana. Grab their signature Hana Lunch Box (everything you need for $12). 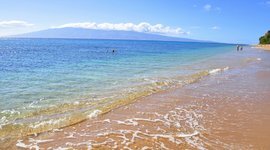 Maui's most popular beach, Ka'anapali is one mile of perfect sand. It's got snorkeling at Black Rock, dining and shopping at Whalers Village, and tons of fun energy. There's a fun waterslide and pirate ship pool for the little ones. Relax by the adult pool or on Ka'anapali Beach, just steps away. 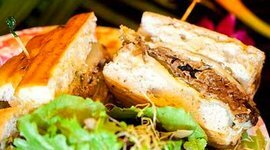 You also have three delicious on-site restaurants.